These spreadsheets utilize VBA macros, which must be enabled in order to function properly. Many of these spreadsheet templates utilize ActiveX controls, which function only on PC’s (ActiveX controls are not available on macs). This spreadsheet is used in conjunction with a mBed microcontrolled pH meter. Calibrate and measure. 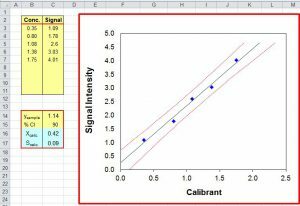 This spreadsheet generates error bars associated with a calibration curve. Auto updates and generates important statistical info. This spreadsheet uses a moving-weighted average (Savitsky-Golay algorithm) to improve signal-to-noise while maintaining signal features. Copy/paste data into template. 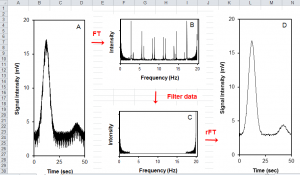 This spreadsheet enables periodic noise to be removed from a signal using Fourier Transforms. 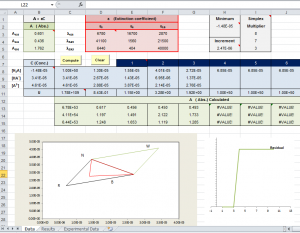 This spreadsheet implements simplex optimization rules to determine the best conditions for a problem involving multiple independent variables. This spreadsheet is set up for a classic calculation using Beers Law. It can be modified for other experimental situations where multiple variables are involved (e.g. time, temperature, pressure, flow rate, etc.